I stamped the bike on acetate using StazOn ink and stapled it onto a Wilderness Photochip. This set comes with great words. New Release: Essentials 13 Collection, Background Stamps, Eclectic Stamps & Quote Stamps! We've also added new stamps to our 'Electic Stamps' and 'Quote Stamps' ranges. These are available as single stamps and are suitable for card making, art journals, scrapbooking, mixed media and more! All products are available now here or please contact your favourite Darkroom Door stockist to order! We hope you enjoy using these new stamps in your artwork! Hi all!! 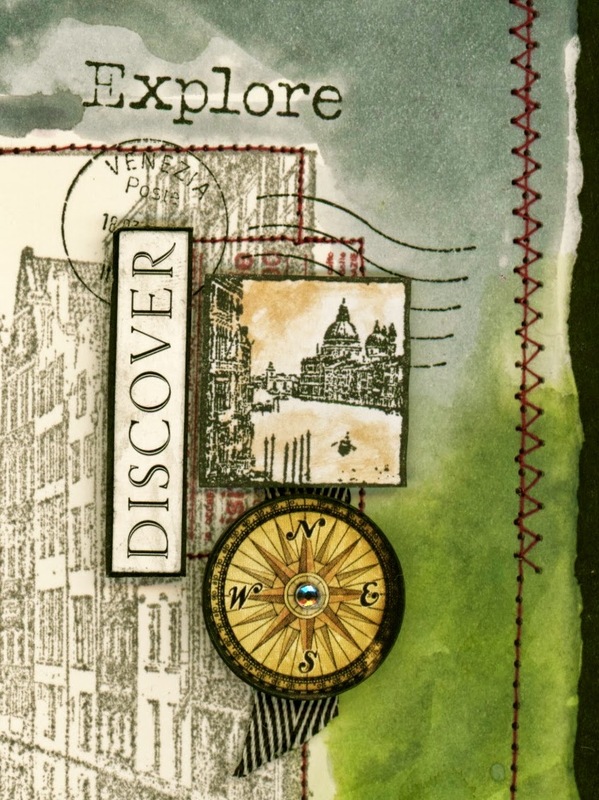 It's Belinda here today with two cards to share featuring the fabulous new Compass Eclectic Stamp. First up is an easel card. 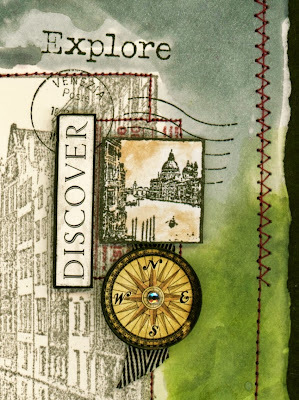 I applied the Compass Stamp as well as some stamps from the Steampunk Stamp Set onto my background patterned paper using Coffee Archival Ink. I then applied a quote stamp from the Vintage automobiles Stamp Set using embossing ink and heat set with white embossing powder. I also embossed the compass onto my chipboard hot air balloons. My second card was created in the same manner. Full instructions on how it was made can be found on this blog post. 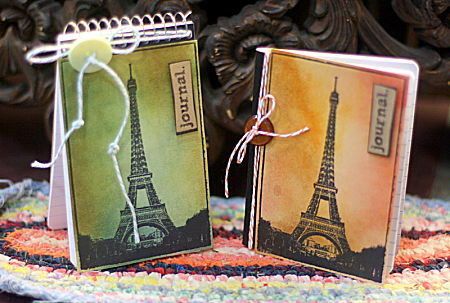 Hi, Connie here with a fun, easy project using the Eiffel Tower Photo Stamp and the Sensational Quote Stamp. 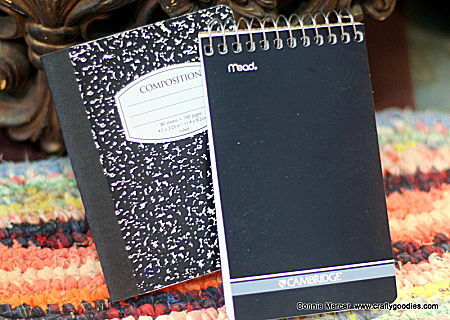 All you need is a couple little notebooks like these. I didn't buy anything, just used what I had on hand. I stamped the image on some cardstock and used my Ranger inks, to add some color. I then glued the piece to the front of the notebook. I added some twine and a button. 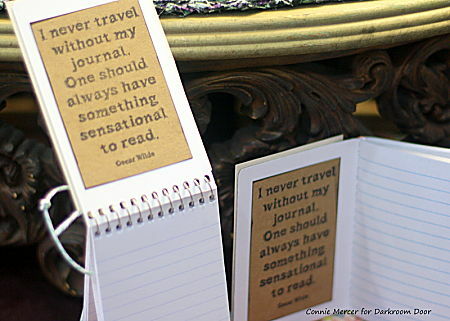 I highlighted the word journal from the Quote stamp for the label on the front. I stamped the inside with the same Sensational Quote stamp, I also used the word journal from the quote to stamp on the cover of the books. I hope you enjoyed this project. A great teacher gift!!! Hi stampers! Sephi here with a project featuring the beautiful Ferns Photo Stamp. 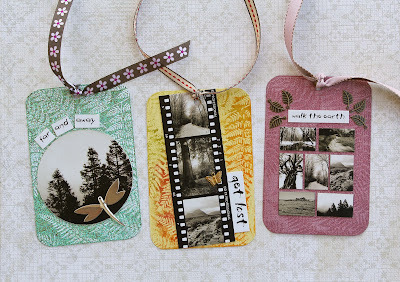 As you can see from the photo below, I've made a trio of tags to demonstrate the ways you can use this stamp to create three unique backgrounds. 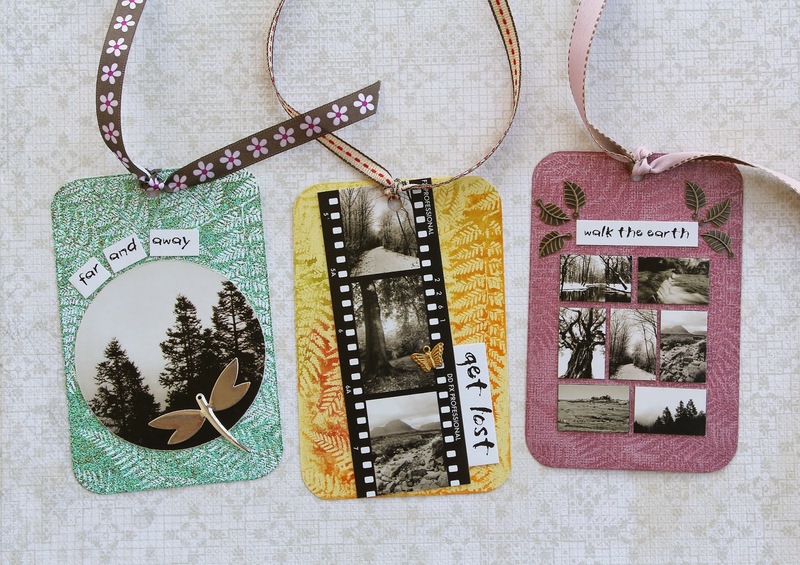 The first tag is embossed, the second faux watercolour, and the third is a soft chalkboard effect. 1. Stamp the Ferns on white card using Versa Mark ink. 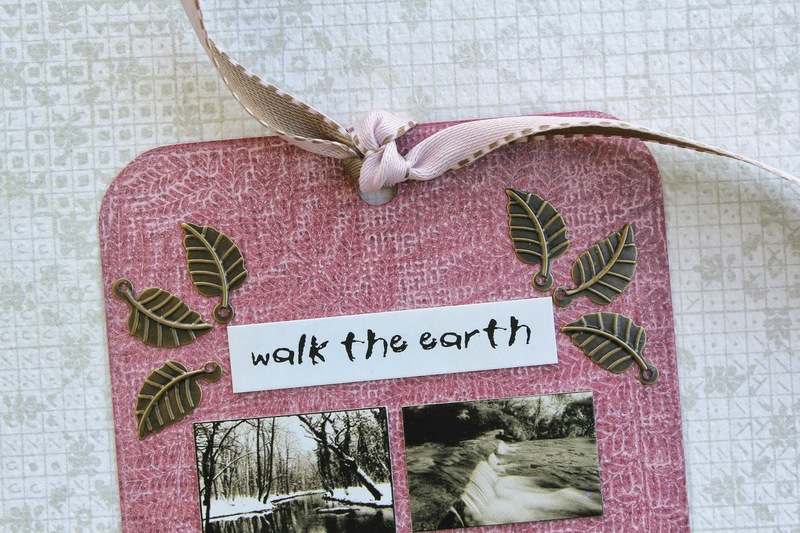 Sprinkle with embossing powder and melt with a heat gun. Trim around the image and round the corners. 2. 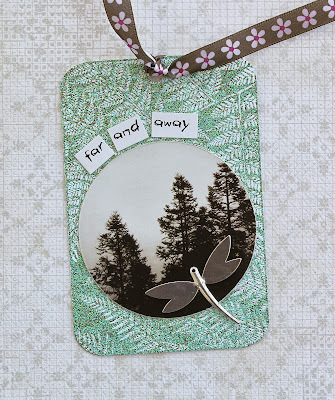 Cut a circle from a Wilderness photochip and affix to the tag. Cut a wordstrip into three pieces and affix also. 3. Punch a hole through the tag and tie with ribbon. 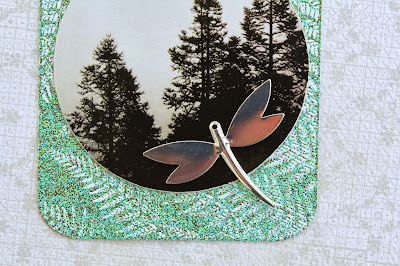 Finish with a large dragonfly charm. 1. Stamp the Ferns on yellow card using several shades of Distress ink. Spritz with water and set aside to dry. Trim around the image and round the corners. 2. 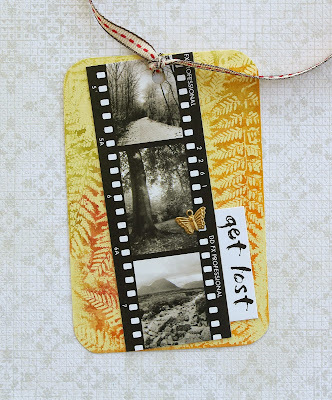 Affix a Wilderness filmstrip and wordstrip to the tag. 3. Punch a hole through the tag and tie with ribbon. Finish with a gold butterfly charm. 1. Smear white ink over burgundy card. 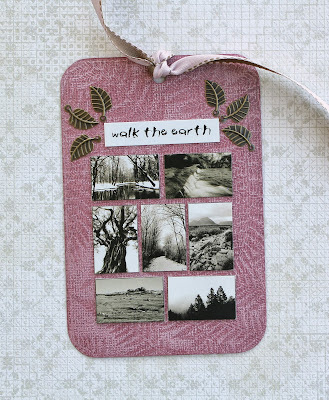 Stamp the Ferns using pale pink ink. Trim around the image and round the corners. 2. Cut Wilderness images from the montage sheet and affix to the tag, along with a Wilderness wordstrip. 3. Punch a hole through the tag and tie with ribbon. Finish with several small leaf charms. Hello stampers! 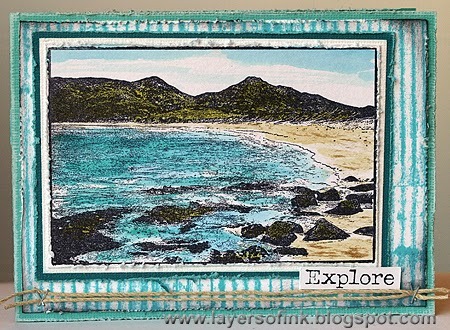 Anna-Karin here with two cards using the new Wineglass Bay photo stamp. 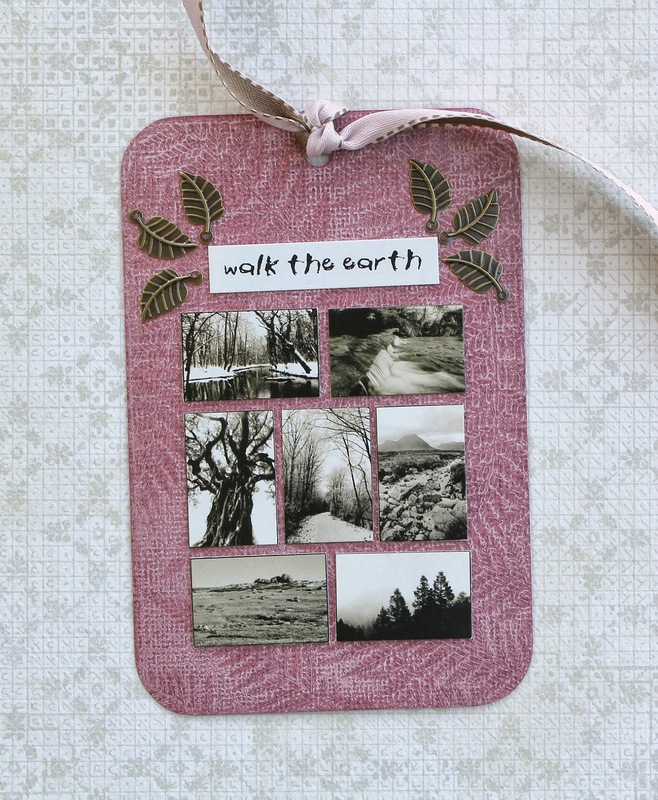 I love all the Darkroom Door photo stamps and this one is no exception, such a beautiful image and the stamped detail is amazing. For my first card, I stamped Wineglass Bay on glossy cardstock with Jet Black Archival Ink. I find that the combination of glossy cardstock and Archival Ink gives the very best detail when it comes to photo stamps. The scene was coloured with Distress Inks, using a Colorbox Stylus Tool to apply the ink. You can use another type of ink applicator too, but I like the control I get with the Stylus Tool. For a colouring tutorial, check out this post of mine, where I show how to colour photo stamps with six different mediums. Highlights were added with a white gel pen. White pigment ink was dry-brushed on the scene, to create foam in the water and a little bit of mist in the hills. 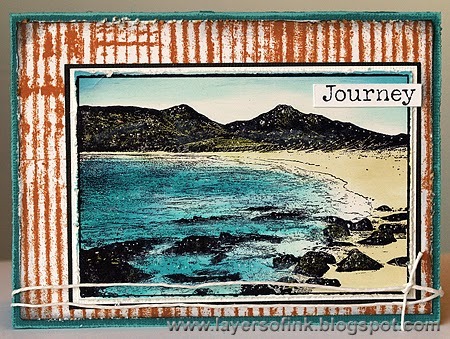 For the background, I stamped the Corrugated Iron background with Orange Blossom Archival ink and layered everything on a Core'dinations cardstock base. 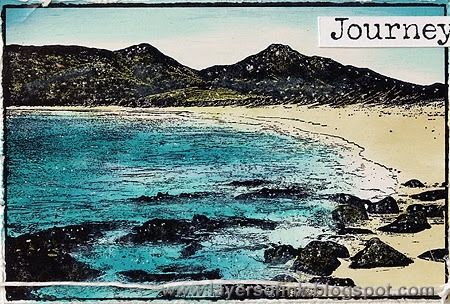 For the second card, I stamped Wineglass Bay with Jet Black Archival Ink on the smooth side of Ranger's new watercolour paper. The scene was watercoloured with Distress Inks - smear the ink on your craft sheet, mist once with water and pick up with a paint brush. Again, I used the Corrugated Iron Background, but this time stamped it with Archival Aquamarine. The sentiments come from Venetian Vol. 1. Hi stampers! 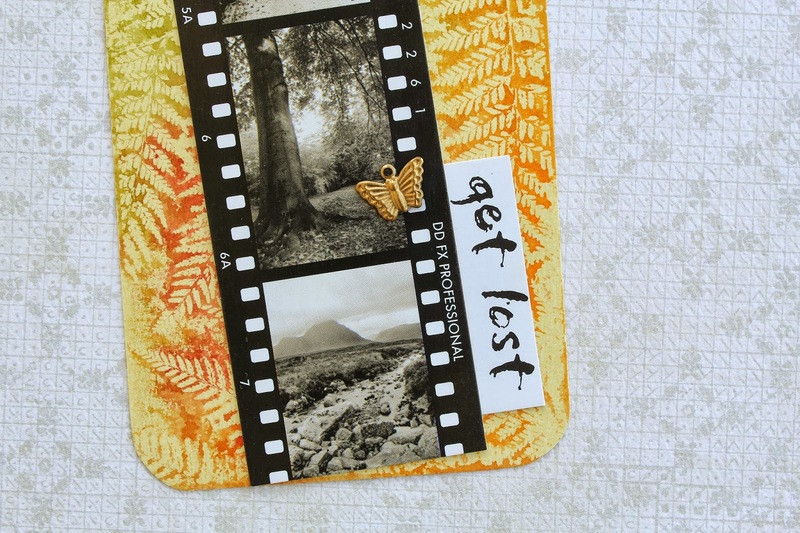 It's Susie here with a card using the Canal Photo Stamp! I'm hoping to explore and discover some of the wonder of Europe one day. As a child, I was mesmerised by my parents recollections of their time visiting this amazing place. 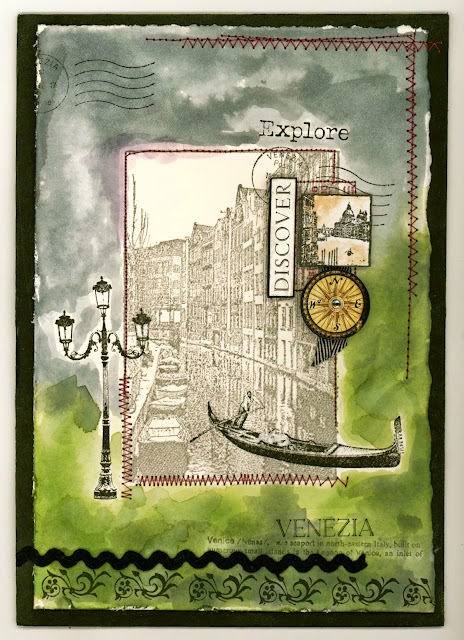 When I received 'Canal', a new photo stamp by Darkroom Door, I thought it would be the perfect backdrop to use with Darkroom Door's Venetian Vol 1 stamp set. Nearly all of the stamping was done on only one layer of card. The only layered pieces are in the top right corner where I've layered a sentiment from Darkroom Door's Venetian wordstrip, an inchie from Darkroom Door's Travel Inchies stamp set (which have both been mounted onto dimensional tape) and a compass sticker (Tim Holtz) affixed to a button with a strip of ribbon and gemstone. To finish this piece off I've added a strip of black ric-rac along the bottom section of the card.